What’s Wrong With Animal-Friendly Animal Products? The ethical consumer cannot simply trust a brand claiming to be animal or environmentally friendly; we all have a responsibility to do a bit of research to make sure a product is as ethical as it claims. If the ethical exploitation of animals is at all possible, then it must meet certain welfare standards. The RSPCA ‘Freedom Food’ label is one brand which claims to raise and slaughter animals in better conditions than the rest of the meat and dairy industry, and it distances itself from the evils of factory farming. Hillside is an animal sanctuary located in Norfolk, which has conducted several investigations into Freedom Farms, and has uncovered evidence of animals suffering conditions as bad as, and sometimes worse than traditional farms. The idea behind RSPCA monitored farms is a noble one, though it has been repeatedly shown to be a failed model. Freedom Food is a charity set up over 20 years ago to ensure that every aspect of those animals’ lives meet the high welfare standards of the RSPCA. Freedom Food is thee only UK assurance and food labelling scheme dedicated solely to improving farm animal welfare. Many of the birds had lost half their feathers and clearly had painful leg deformities. The filthy shed floor was littered with corpses, some in an advanced state of decomposition. The problem with failing Freedom Food farms is widespread, as this report into pig farming demonstrates. However, this is a brand that is not doing too badly compared with other so-called ‘ethical’ brands. A report in the Independent rated Freedom Food as second, with Soil Association scoring 9/10 in ensuring the highest welfare standards were met on its certified farms. – The Freedom Food label does not mean ‘free range’. The RSPCA does not feel it necessary that broiler chickens ever experience the outside. – Freedom Food birds reach slaughter weight within just 49 days; in the wild, it takes chickens around three months to reach adult size. Leg and hip injuries are common place on intensive farms, and they have also been seen on Freedom Food farms. 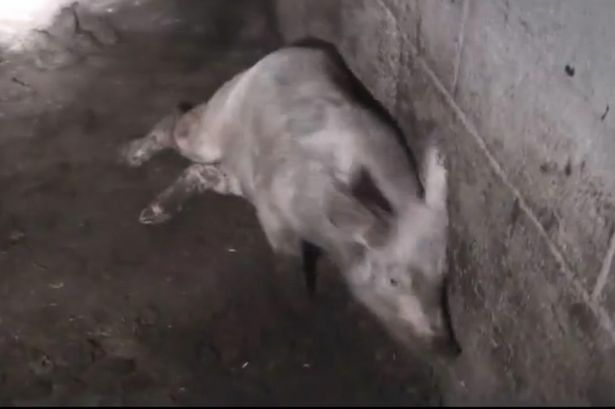 – Sows are still forced to give birth and suckle their young for around 4 weeks in farrowing crates, which are so small that they cannot move. – Some ‘free-range’ labels claim that piglets are either ‘outdoor-bred’ or outdoor-reared.’ In both cases, piglets might be bred or reared outdoors for several months but they are moved indoors into fattening units, which are cramped and overcrowded, and provide no stimulation. – ‘Organic’ means that the use of chemicals in animal feed is prohibited. Arguably, animals lead slightly better lives on organic farms, but male chicks are still gassed at birth and male calves are still shot because they are of no use in the dairy industry.